I don't really enjoy tracking and doing things by "months". I feel it makes time pass too quickly and I'd rather focus living day-to-day. Regardless, I'm going to track two things for the month of March. I won't be drinking pop or coffee with a ton of creamer. There are a couple of exceptions though. If I need to drive and need a caffeine boost, I'll drink pop or coffee with creamer. Shopping Ban: Outside of basic necessities (food, toiletries, prescriptions, etc. ), I won't be buying anything new. I'm kind of bummed about not being able to drink pop, and I think this'll be the hardest part. Hopefully Robinhood Instant comes out soon to keep me preoccupied. I should also be exercising more now that it's getting warmer out to keep me preoccupied. It was a year ago today that I almost got into a pretty bad car accident. I was going into a roundabout and got distracted by the car in front of me, I started to enter the roundabout and then slammed my brakes. A red car when racing by in front of me, and I was momentarily shocked at where this car came from. I still don't know why I didn't look closely before going into a roundabout. I was very mad and upset with myself, and I eventually started thinking of the root cause of the problem. Why did I almost get into a car accident? I was distracted by work. Why was I distracted by work? I hated my job. Why did I hate my job? My boss and his assistant were intimidating me/bullying me. Why was I in a job where I was being intimidated/bullied? I didn't think I had a choice in leaving. Why didn't I think I had a choice? I would have had to pay back $17,000 in relocation expenses and was willing to stick out my job a year before quitting. I acknowledge I would have been at fault had I gotten into a wreck. As far as I know, it could have been a pretty bad wreck and I could have been T-boned. People are supposed to slow down in roundabouts, but the red car was probably going 30 mph in the roundabout, and had I been T-boned, it definitely would have caused some damage. I'm happy nothing happened, but it was a huge wake up call for me to get out of my job. The biggest thing I've been stressing to my friends is to interview a potential employer as much as they're interviewing you. I've also been telling my friends to not buy a house, unless you know you want to be somewhere for 5 years. This is a big reason why I'm working on being a minimalist. I want to have the option to be flexible on where I live, and I don't want to be tied down anymore. My employer doesn't choose my happiness, and if I need to move/leave a job in the future, I'm going to. If you're still here reading, I say thanks. I encourage you to evaluate your work life and to make sure work is not weighing you down. If you're able to separate work life from personal life, congratulations, that is a skill I did not have. I also want to say that YOU have a choice in what happens to your life. I didn't think I had a choice, and was stuck in the cycle of being bullied and intimidated at work, and I should have just walked away and/or reported it. I didn't think I had a choice, but I did. According to to the graph on my Robinhood account, my account's return has normalized to the levels it was for the last half of December. It was early January when the market dropped, and now it looks like (my stocks at least) have come back up. 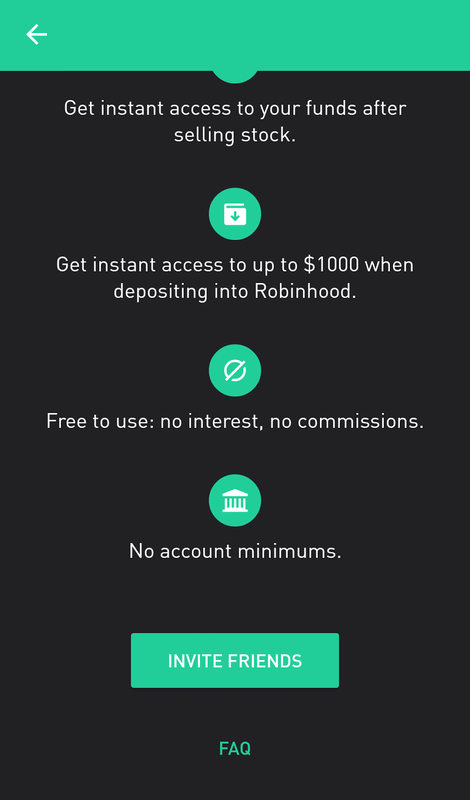 While Robinhood Instant is "released", there is a line right now to gain access to it. The app has the capability, it's just not available to everyone yet. I will be adding more money to my account once I have access to Robinhood Instant, so I don't have to wait 4 days to use my money once the transfer initiates. With RH Instant, when I initiate money to be moved to my account on a Monday, it will be ready "instantly" to make trades with. At the time of writing this, I am in the top 6,000 in line of 136,245 people. Receive $75 in dividends: $11.33/$75.00 - 15.1% Completed. The year is 15.8% completed, so currently, I am not at the pace needed to complete this yearly Mission. I talked previously about doing a shopping ban in March, and I'm also considering going a month without coffee. I don't buy coffee from Starbucks or local places too terribly often, but I find myself still spending too much money on coffee and coffee creamer. If I had to go through each purchase on my grocery receipt, and decide what was needed or not needed, my coffee and creamer isn't crucial. I would still keep some on hand in case I was super tired in the morning, but maybe I should get used to not drinking it every day. I'll save money not drinking coffee and also save on calories. Lately I've been thinking about my life when I was younger, and I didn't drink coffee back then. What has changed that now I'm an adult? For me, I like getting the caffeine and I like the taste. It's also a part of my morning routine. Do I stay up a little later at night knowing that I can make some coffee in the morning to help wake up? I didn't have this option when I was younger. I'm going to try this out in March, along with my shopping ban, and I'll let you know how it goes! More and more I find myself asking "Where do the days go?" I keep telling myself "Tomorrow is the day I get in good routine and start being more productive." This usually doesn't go well. I need to start living more in the present. We all get the same number of hours in each day. No one gets 23 or 25 hours. We all get 24 hours in each day. We choose what we do with these hours. Part of my former job as an industrial engineer was to figure out which processes were "value added" and which were "non-value added". I think a lot of my (our) days are filled with non-value added time (NVA). I hate feeling rushed and I hate feeling busy. People who pride themselves on being busy are not people you should look up to. At this point in my life, I should know what I'm capable of accomplishing. I need to be happy with what I'm accomplishing each day. I'm categorizing this post as minimalism because I want to go through each day feeling like I accomplished enough. I don't want to feel like I need to do more (outside of what I actually need to do). I don't need to spread myself thin, and I need to put quality and intentional time into the things that I want and need to do. I don't want to be like Luke Skywalker, stuck on Tatooine, always looking towards the future. I need to work on appreciating moments of each day, such as when I see a dog or eat a slice of pizza. I need to find value in conversations with people, and walk away from conversations that do more harm than good. I need to spend more time with my friends and family too. Robinhood Instant is on its way! I looked at my phone this morning to find updates related to it. There is a new tab/section on the app for Robinhood Instant. When I click on it, it tells me my place in line. When I checked this morning I was about ~1,800 in line out of 15,000 people. When I checked this afternoon, I was ~3,000 in line with 80,000 people. People can move up the waiting list by referring friends. I'm excited for this update because I think it'll bring a lot of new users to Robinhood. The more users that come to Robinhood, the more money the company will make, and the better service they can provide to the users. This will also make ETrade and TDAmeritrade work harder to satisfy consumers, which is a positive for all of us. I knew this update was coming soon, but I didn't quite know when, and my guess was early March. I'll have to wait and see how fast I move up the line, but hopefully by next week I'll have Robinhood Instant access. For the month of March, I am considering doing a shopping ban. There are other minimalists who have done this, and I think I should too. The concept of this is that you don't purchase anything besides toiletries, groceries, prescriptions (and other necessities). This won't be too big of a deal for me, because I hate clothes shopping, and I also don't buy a lot of "stuff" anymore. The purpose of the shopping ban is to show how much "crap" we buy on a regular basis, and that we can also live without it. I will have to come up with some guidelines for my shopping ban, and this will come from reading other minimalist's versions of their shopping bans. At the end of March I should have money in my pocket, a cleaner apartment, and a better appreciation for the stuff I have. I'm really excited for Robinhood Instant, and I'm looking forward to it being launched. 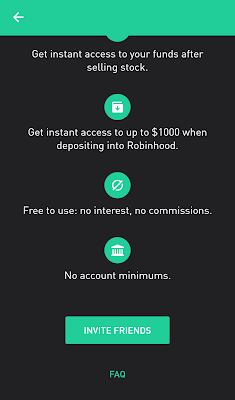 Judging from the Robinhood subreddit, some people already have RH Instant from having enough friend referrals. This means that the coding/programming is up and running, and hopefully it's rolled out to the rest of us soon. Robinhood Instant will be an update to the Robinhood App. With the update, if I sell a stock on Monday, I can use that money to buy another stock "instantly", or right away. I won't have to wait 3 days for the funds to settle. This can be very good and very bad, which is why there will be "Pattern Day Trader" protection available. I received two dividends this past week. One from Procter & Gamble for $0.66 and one from Realty Income for $0.20. My dividend from Realty Income last month was $0.19, so I've already seen a dividend increase from them. I did not buy any stocks this week. After I get my tax return, I'll most likely buy as many stocks as economically possible/feasible. Receive $75 in dividends: $11.33/$75.00 - 15.1% Completed. The year is 13.7% completed, so I am on pace to complete this Mission by the end of the year. I think I spend more when I use my credit card. I've never carried a credit card balance, but knowing the money isn't taken directly from my checking account, I'm OK with not thinking as much about my spending. Fraud protection is covered under debit cards as well as credit cards. Cash back bonuses are nice, but not life-changing. If I'm intentional about where I spend my money and where to find good deals, I can make up the difference that I lose with the cashback bonus. If I don't have the money to buy something directly, I shouldn't buy it. (I treat my credit cards like debit cards, but still). I didn't get approved for another credit card, so now I'm pouting by not using them at all. With my credit score being wrecked by my house, I don't really care anymore about the "idea" of credit scores. Again, I'm pouting, but it's a way by the "establishment" to control us and make money off of us. I treat my credit card like debit cards, and I'm tired of taking time to pay off my credit card balance every few days. So this is where I am at right now. There are multiple ways to think about using or not using credit cards, but right now, I'm not going to. I won't be buying a house again for a looooong time, if ever. I also hope to buy my next vehicle outright. So without needed my credit score for a house or car, I don't see my credit score being an issue. I am going to start eating breakfast again every morning. The habit of not eating breakfast probably started in college. I had a 14 meal/week dining plan, which was reserved for lunch and dinner. I've heard health/weight loss advice before saying to eat breakfast, and I think it's pretty common knowledge. Aside from this knowledge, I haven't been doing it. I am going to try and eat cereal every morning. I did this from ages 4 - 18, and I can do it again. I would like to eat Lucky Charms, but I know there are *somewhat* healthier options. I think cereal here is around $2.99/box and the milk I buy is around $2.99/carton. 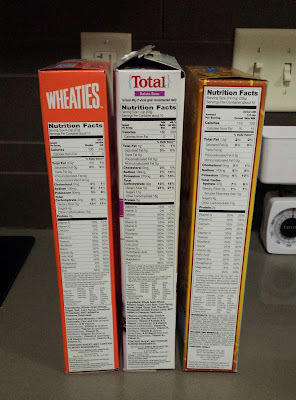 If I actually measure the cereal and milk out, both should have no problem lasting all week. $6.00 for both items, and it should last me around 5-6 days, so that's about $1/day for breakfast. I've been doing this recently, and I'm not as hungry for lunch, and I think it'll help keep me from eating too many calories throughout the day. Side Note - although two of the cereal brands below are General Mills, I'm still somewhat skeptical in investing in General Mills (GIS) right now. "W.E. 2/13/2016" means "Week Ending" 2/13/2016, I think of weeks in terms of Sundays to Saturdays. I'm going to be honest, and say that this week did not go well. 10% of my Missions were completed this past week, and this isn't a good completion rate. Minimalism - Implement a "Only things with legs or shoes" touches the floor. No clothes, boxes, or other crap can ever touch the floor. It's HOT LAVA!!!!! Some improvement, but not much. Investing - I think I finally found how I want to budget/track my spending, and it's within a pre-built template in Google Sheets. My Mission will be to document every penny of spending this week. Using Google Sheets is going to be the best way for me to track my spending, and I actually kept up with it as much as I thought I would this week. Technology - Delete/Archive 100 emails. Conservation - Get some new rags/cloths. I feel I go through too many paper towels. Health - Follow up my push-up plan from the previous week. I believe in traditions and themes. I also believe in continuous improvement. I am going to take a break from the weekly Missions. I am the type of manager that sees an issue and adjusts accordingly. One of my 2016 Health Missions is to plan my meals out on a weekly basis and make my meals on Sundays. Step 1. Don't ever finish a meal. I temporarily stopped my weekly deposits into my Robinhood account. There was something weird going on with the amount of time it took for my funds to clear, and so I just stopped it for now. I am still 100% behind Robinhood, and I just hope that these changes are in preparation for Robinhood Instant. My weekly transfers used to initiate on Mondays, and my funds would be ready to trade Wednesday morning. The past 2 weeks, the funds would initiate on Monday, and wouldn't be ready to trade until Friday. This past week, the funds didn't even initiate on Monday. I probably should have contacted Robinhood Support, but I'm not too worried about it right now. To be honest, I'll probably use my tax refund to buy the remainder of the stocks I plan on buying in 2016, and go from there. I did not receive any dividends in my Robinhood account his week. I did receive $6.90 in dividends from my Apple stock on my other brokerage. I bought 1 stock this week, and it wasn't a stock I have purchased before. This is my attempt to diversify my stocks, so I bought a stock in the utilities sector. Receive $75 in dividends: $10.47/$75.00 - 14% Completed. YouTube premiered original content today. This original content is being categorized into "YouTube Red". You have to pay a monthly subscription for YouTube Red, but I am able to access it because I pay for a Google Play Music subscription. Aside from the technicals of who can watch YouTube Red, this is great news for cord cutters. I love that non-traditional companies are making original shows/content. Netflix is doing this, I believe Amazon is, and now YouTube (Google) is too. If you have Hulu, know that you're still supporting NBC, Fox, and ABC. I think Hulu's pricing plan is crap, and I'll never pay for it. I don't think you should have to pay for a service and still have commercials. YouTube Red is creating competition for the market, and competition is great for us consumers! The big cable companies do not dictate how we watch television anymore, and I love it. Consumers want choice, and we decide when/where we watch television. The big cable companies couldn't accept this fact, and that is why they are going to lose money to YouTube and Netflix. I'm not 100% sure if the situation I'm going to describe fits in the exact definition of "planning fallacy", but that's what I'm titling this post anyways. I had to give a presentation tonight, and I wasn't foreseeing any major problems. I even got to the room I was presenting in 30 minutes earlier to get set up and prepared. Well, there wasn't a computer in the room, just the cords to hook up a computer. I needed a computer for my presentation which was on power point. I wasn't even mad, because I've done enough presentations to know that something would go wrong. I was just more mad at myself for not scouting the room out sooner. I figured 30 minutes would be enough time. The presentation still went well though. We had enough laptops for everyone to see the video I was trying to show. I will just have to plan better next time. For real though, I will need to plan better next time. I've proven to myself that making a set plan with buying stocks has helped me to stay focused and reduces worry. I need to plan better in other areas of my life as well. I can't be the only one who throws clothes on the floor. Yes, it's a bad habit. Yes, it's a sign of being lazy. Yes, it makes life harder for figuring out which clothes are dirty and which can be worn again. But at the end of the day when the only priority is going to bed, being lazy and throwing clothes on the floor is justified. Pretending the ground is lava, and jumping on furniture to avoid the floor is a fun game. I would still play, but I don't want to break my chair or couch. I will use the premise of this game to keep my apartment picked up and tidy. If an object doesn't have legs (furniture legs, bed frame), the object isn't footwear, or the object isn't a clothes hamper, it can't be on the floor. Ok Mitch, cool story, but it's probably easier said than done. I will utilize existing shelf, closet, and cabinet space to fit my stuff. If there isn't room, I will get rid of some things. I also want to look into getting a coat rack, as Minnesota warrants many layers. A lot of my jackets/coats end up hung over my chair. That's my plan and that's my Minimalism Mission for the week! "W.E. 2/6/2016" means "Week Ending" 2/6/2016, I think of weeks in terms of Sundays to Saturdays. 80% of my Missions were completed this past week, and this isn't a good completion rate. Didn't get done. I know a decent amount about it, and I want to learn more about being able to text from your computer. I have and love Verizon's cell phone service. I plan on holding this stock for a long time, plus it pays a good dividend. It makes sense that I would review VZ early on. I watched a video from their website - https://www.youtube.com/watch?v=PJ1U3U3S-hA, and read up on some additional information. I'm going to follow this - http://hundredpushups.com/week1.html , along with this video - https://www.youtube.com/watch?v=4dF1DOWzf20 to get my form down correctly. A site/blog I'm reading more and more is www.budgetbytes.com. Beth has made this site very easy to read and very easy to understand. Each of the recipes has the dollar cost-per-serving, along with step by step pictures on how to create the food. With the name "budget" in the name of the site, you might think there are minimal recipes with meat, since meat tends to be expensive. There are plenty of recipes with meat, although it's probably a healthy/normal portion of meat, and nothing like what we might consider "normal" (like eating a whole slab of ribs). As I work towards cooking food that is healthy and cost efficient, I will be referring to this site a lot. Also, the step by step pictures help me a lot, because I need my hand held when cooking food. Lastly, Beth does a summary of every week's recipes, and within this summary she posts pictures of her receipts of the food she bought. For me, this proves that cooking on a budget can be done, and the average Josie/Joe can do it too. Above is a tease from Robinhood about "Robinhood Instant". From reading the Robinhood subreddit, this update will bring a few things. My weekly transfers of $25 from "Money in my pocket" into my Robinhood account will be ready to trade on Monday mornings, instead of just initiating on Mondays. If I sell a stock, I won't have to wait 3 days to use that money from the sale to buy another stock. Monitoring by Robinhood to prevent getting your account suspended for "Pattern Day Trading". I have a lot of thoughts about this, but since I don't personally have Robinhood Instant, I can only talk about from what I've seen other people post about. I think Robinhood Instant is in beta testing, so at least it's somewhat developed. Their tweet on January 6th said "coming soon", so we'll see when it actually launches. This is going to be a huge update for Robinhood and could potentially bring a lot of people over from traditional brokerages that charge $9.99/trade. Competition is good! When I made my 2016 Investing Mission of receiving $75.00 in dividends, I didn't really plan this number out. I just figured $75 was a respectable amount to work towards. Just considering the money I have in my Robinhood account, reaching $75 is not obtainable. If I factor in the money from my other brokerage, this Mission is obtainable! I went through every single stock I plan on buying and projected out the dividends I'll receive. Below is a link to a google doc where I projected these dividends out. By these projections I'll receive $74.18 in dividends. I was conservative with my estimate, so I don't think I'll have a problem reaching $75 in dividends. Owning stock and watching the market swings can cause worry and concern. I have fewer concerns when I make plans and projections like this. The key word to this is "projection". My actual dividends aren't going to be exact to this projection, but it should be close. If left unchecked, my key chain is another area that builds up with "stuff". There are a few reasons why I de-cluttered my key chain. 2. It was taking too much time to find the right key for the door I was entering. 3. I had old keys from my former job and my house that I don't need anymore. This may not seem like a typical item to de-clutter, but I know whenever I clear out my wallet I feel better and lighter. I hope to have these same feelings now after de-cluttering my key chain. I took off 5 keys and 2 key rings. I hope to find a recycler to recycle these old keys, and am hoping it'll be as easy as taking them to a hardware store. Don't just throw old keys away! Lastly, I need to make some sort of tag on how to contact me in case I lose my keys. I have faith in humanity that if I lose my keys, and someone finds them, they'd call me to return them.